1. Overseas holidays. As you read this I will be on the Gold Coast with my family. I'll be shopping, theme-parking, relaxing and being a tourist. I hope it's warmer there! 2. $2 lipsticks. This week I've been wearing Jordana's Holiday Red. While it felt drying on the lips pretty quickly, the colour was stunning and lasts relatively well. Cheap lipsticks are great when you're wanting to trial a colour before investing in a more expensive version. 3. Indoor picnics with friends. On Tuesday we celebrated a friend's birthday early. There was delicious but bad food, bad music (birthday girl's choice) and incredibly bad bluffing during games of Poker. It was a fun afternoon. 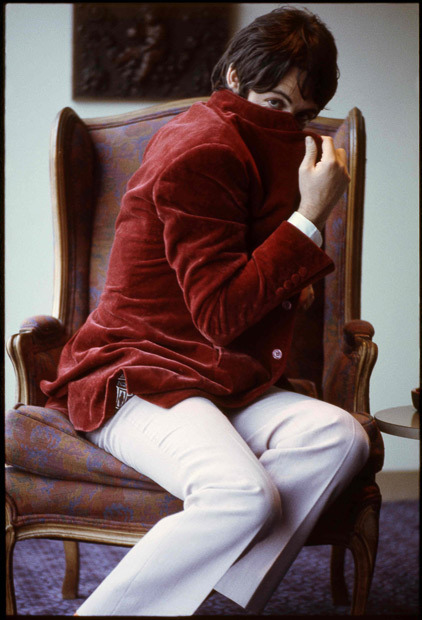 Paul McCartney by Linda McCartney. 4. Winning things, Round 2. I never usually win anything, and when I do it doesn't happen again for ages. Well imagine my surprise when I won a DVD of The Artist. I can't wait to finally see this film. Thanks Cecylia! 5. Duty Free, undoubtedly a girl's heaven at the airport. I've pre-planned what I'm purchasing, it's less risky that way. Let's just say there'll be more additions to the beauty bazaar soon. 6. This video by vlogger Fleur De Force of her monthly must-haves. There's some great products reviewed. I wonder if anyone else can work out why I love this video so much.